Kit preview of ERTL's Gungan Sub. Molding Quality: 8 - no flash, mold release points all on interior surfaces. Detail: 8 - mostly raised (exterior) and soft. MSRP: $11-15 USD, available from most hobby shops and discount stores. The Gungan Sub, or Bongo as it's referred to by Jar Jar Binks, is an interesting subject in that it's a) a submarine, and b) devoid of straight lines. The kit is small but nice looking with good surface detail. It comes complete with cargo in the two outside holds and three seats with good representations of Qui-Gon Jinn, Obi-Wan and Jar-Jar. The figures are very static, with everyone with hands at their sides. Unfortunately that's about all there is in the cockpit, so there are opportunities for detail. The quoted scale is 1/48th but the figures are closer to 1/72nd. Pictures of the cockpit seem to indicate the figures are too small but 1/48th figures would be too big for the cockpit. As always I read the directions first (don't we all) paying special attention to the painting detail and found three problems. First, there is no suggestion as to what the base color is. I'm sure if you ask ERTL, they'll tell you it's molded in color. Yeah, right. The sample at RCHTA in Chicago suggested the base color was light blue. The picture on the box side seems to suggest a light RLM Gray (like RLM 02 gray/green). Next, (of course) ERTL is very vague about specific paint shades for the rest of the kit. Lastly, they misprinted the instructions in two places. 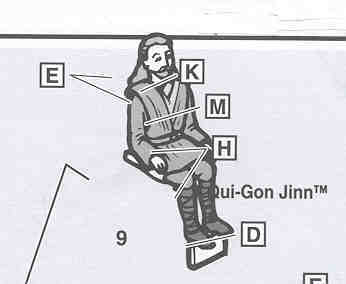 The painting diagrams for the cargo bay floor/detail (part 6) and for Qui-Gon Jinn (part 9) are both misprinted with the part image shifted. 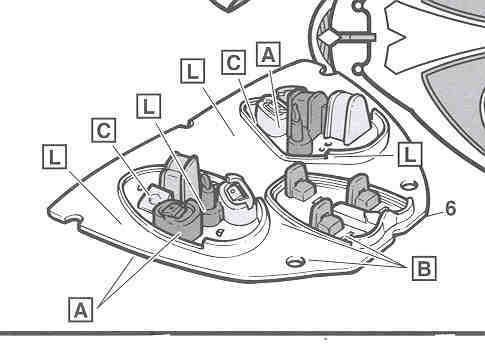 Check the attached pictures and you can see that the images of the kit part are in the wrong place because they overlap other parts and the borders. You need to move the ends of all lines about 3/8" left and up (north-easterly direction). Otherwise you'll be painting things the wrong color. All of the detail areas to be painted on the top and bottom hull are raised so this looks like a job for a steady hand. The intricate pattern, curved surfaces and size of the model will make it difficult to mask and airbrush. The pattern on the drive fins comprises a large number of raised dots which need to be painted to get the right effect. This can be dry-brushed but again the curves will not make this easy. Nice kit but strange choice for a Snap-Fit. There's no way a beginner can make a fair representation of the subject – the painting is much to complex. And without paint, there's no color on the kit. It's certainly a subject we can all work with, but it could have been bigger. 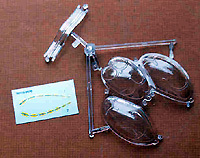 Anyone know the scale of Galoob's Opie Fish toy? Would it work with the Bongo? Many thanks to Jim's wallet for providing the review sample. Manufacturers and retailers, interested in getting your wares reviewed and publicized? Contact us! This page copyright © 1997-9 Starship Modeler. Last updated on 13 December 1999.